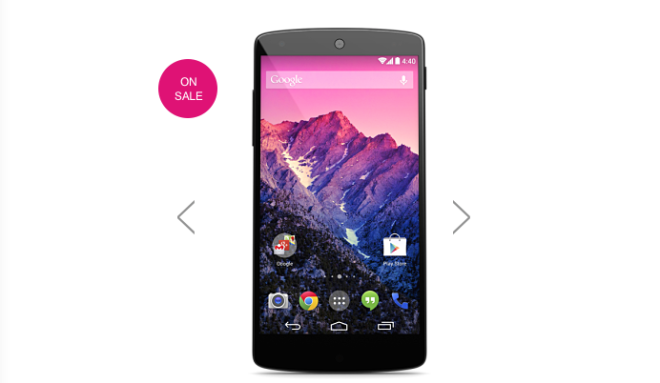 T-Mobile, on Sunday, kicked off a special promotion on its Nexus 5 online. If you buy the device from T-Mobile’s online store and enter code NEXUS5PROMO at checkout, you’ll get $24 off the price. That’ll take it down to an even more affordable $372. Still, some $23 more expensive than the Google Play Store pricing, but you can spread the cost over 24 months using T-Mobile’s EIP and get hooked up on a Simple Choice plan too. For those of you wanting a device running “pure Google” the variety of handsets now available is fantastic. Since Google Play Edition mobile devices started hitting the market, phones like the HTC One and Galaxy S5 have been made available equipped with stock Android. Which is – quite frankly – awesome. But, it’s hard to argue that the best value vanilla Android experience is anything other than the Nexus 5. And – unlike GPE model phones – you can buy the Nexus 5 direct from your favorite carrier. Let us know if you plan on picking up the Nexus 5 for slightly cheaper, or if you have your eye on something else. $24 are kidding me?… Make at least $100.00 and we talk! 1) It prevents cell networks from getting hammered. 2) If there’s an unexpected problem, a limited number of people will have been exposed to it, instead of everybody. Don’t like it? Factory images aren’t difficult to find starting the day of the initial rollout. Yes! Mine is unlocked and rooted, still on factory recovery so I can relock and unroot easily if I ever need to with just a few clicks of a Windows Program called Nexus 5 Root (or something like that). It actually will unlock, root, and install the update for you on release date. I do agree with the staggered rollout, as there was a problem last year with a release of KitKat 4.4.1 that only a handful of Nexus 5 users had to experience. Although sometimes it means you get your update day one, and sometimes it means you get it day 7. You don’t even need root to update to signed official firmware…. Idk I’d rather updates be phased in so if there any problems it will cause the least amount of damage…. The people who really wanted this have or should have bought this during the $200 off per Blackberry promo early this year. I don’t think anything beats that. It was a no brainer at the time…. $24 off and still no wi-fi calling! we’re you expecting the discount to include wifi calling? wifi calling is buggy at best and there are voip apps on the market as an alternative. You don’t know what you’re talking about. I use it all the time. I use it from outside of the US to make and receive calls to and from US. Call quality is perfect. Wi-fi calling is the greatest! I still don’t understand why T-Mobile refuses to put out a WiFi calling app on the Play Store. iOS8 is getting WiFi calling, but half a dozen Android phones are left out. Because it’s not an app. They modify the OS. I believe they’ve stated that they need some enhancements to Android before they can make it an app. (but, I can’t remember where I heard this, so I may be mistaken). Apple doesn’t let anyone touch their OS. Just ask Verizon how much power they had when trying to add “features” to the Iphone. I read up more about it and it’s not a T-mobile exclusive feature. The WIFI calling feature in IOS 8 will work with any carrier that supports WIFI calling. I really love this phone. T-Mobile seems to constantly have a promotion on the Nexus 5. Before they even included the wireless charging pad. The 16GB model is only available in white on Google Play. I am hoping they have a clearance sale like they did last year with the Nexus 4 when it went down to $200 for the 8GB model and $250 for the 16GB model. My phone just updated to 4.4.4. I don’t know what it does though, LOL. On Ebay a very reputable seller is selling brand new 16GB Nexus 5 for $335, plus free shipping.